For 12 years, Heather Munsterman worked as an officer for the Manassas City Police Department, but her dreams of a life-long career in law enforcement were crushed after a devastating crash. In 2013, a distracted driver struck Munsterman on Route 28 while she was outside of her cruiser stopping another driver. The crash left Munsterman with a crushed pelvic bone, concussion, dislocated shoulder, fractured ankles and severe bruising across her entire body. Three years later, Munsterman is walking again, but still battling the injuries that changed her life. “Not only physically, extensive injuries, but also having a traumatic brain injury, learning how to formulate words again,” Munsterman said. In September, she had to leave her dream job in law enforcement behind. Munsterman has found a new passion in trying to combat a growing drug problem. 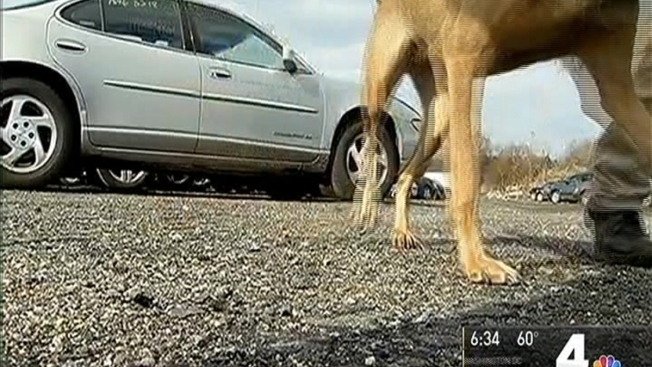 During an intensive 8-week training course, she teaches dogs to sniff out narcotics. Private narcotics detection is an increasingly in-demand field. “We especially here in Culpeper, like many other jurisdictions in this area, have seen a dramatic increase in opioid, heroin overdose, as well as usage. And that alone has made more of a demand the use of K-9s to help combat that problem,” said Capt. Nick White, with the Culpeper County Sheriff's Office. Munsterman said she's hoping to help private schools, businesses and families conduct drug searches. “You think your child is doing drugs or might be in that field, or you just kind of want peace of mind to know that your child is not, you’ll call me in. I can run a room, a car, inside out, or I can run a house depending on what the needs are,” Munsterman said. It's not policing, but it brings Munsterman closer to the job she loved. “This has been therapy for me. It’s been finding something that I love to do again,” she said.